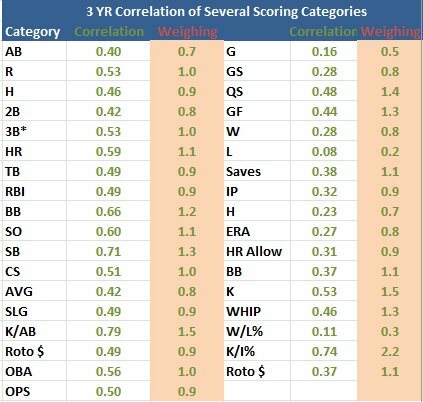 Hi Folks, below is our annual review on the correlation/ predictability for the statistical categories that many of us use in our rotisserie leagues. 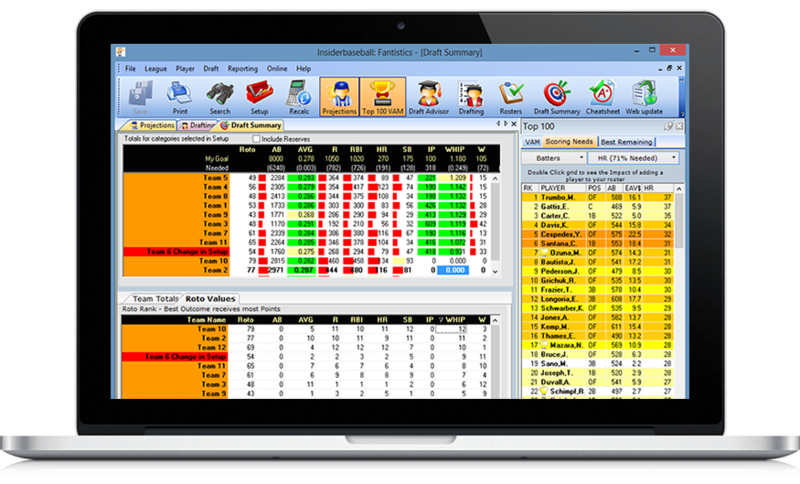 If you play in a Rotisserie league, our software is designed to give you the opportunity to favor the more predictable categories in your league. 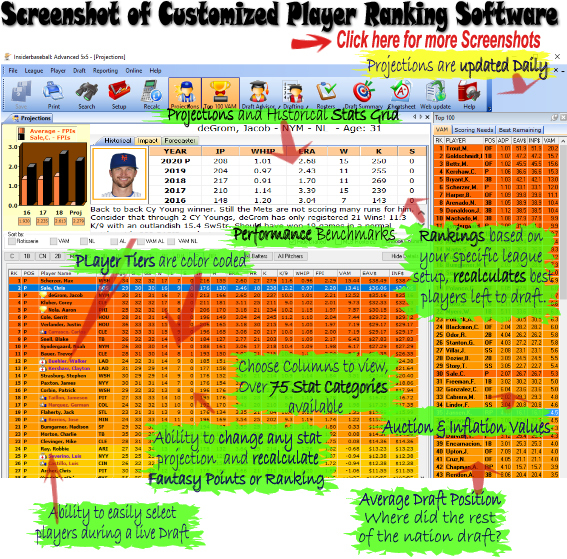 Instead of each category having an even "1" weighting, it's an opportunity to play the percentages of predictability, allowing you to give different weights to each Roto category that are relevant to your league scoring. I'm sure many of you already know that categories such as Batting Average can fluctuate wildly on a yearly basis. So wouldn't it make sense to slightly underweight that category when creating your rankings? Within the Setup|Edit League Settings section, select the Rotisserie scoring option and check the Advanced option located above the scoring grid. This scoring option will allow you to weigh each Rotisserie category according to your preference. Although most leagues use an equal weighing for each Rotisserie category some leagues do not. Even if your league uses an equal weighing system, it's important to understand that not every statistical category has an equal predictability. (See more category correlations by clicking here). In the statistical term of correlation, the range of correlation ranges from -1 to +1, with 1.00 considered a perfect "fit", the better the fit the more reliable the forecast. A .20 is considered a loose correlation, .4 a good correlation, and .6 a very good fit. Thus we know that there is a higher predictability in forecasting Homeruns, Stolen Bases, Pitcher's Strikeouts, and WHIP. A Category that offers poor predictability year over year includes Batting Average, ERA, and Wins. Of note when I ran this for the 2019 weights, there was a improvement in the correlation in Runs Scored and Home Runs. 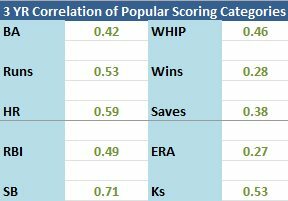 On the pitching front, there was a increase in correlation in WHIP and Saves in 2018. For those who would like to play the percentages, for 2019 we suggest the following weighing within these typical categories. 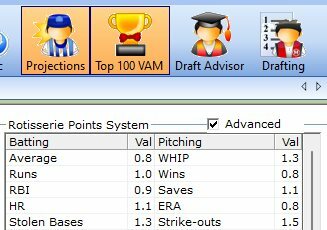 (See more categories for the Advanced settings by clicking here, remember to ONLY USE THE SCORING CATEGORIES THAT YOUR LEAGUE USES!).). How would you apply this to a points league in your software? Would you just multiply the points allocated for each category scored by the weight indicated in this article? Yes that would be correct in theory, however you must consider that you are probably already playing in a points league that doesn't weigh each category equally. in other words, HRs (more predictable) are probably more heavily weighed verses a category like Runs.